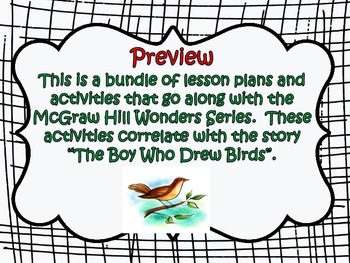 This is a lesson plan bundle that goes along with the McGraw Hill Wonders Reading Series. It goes along with the story found in Unit 2, Week 3: "The Boy Who Drew Birds". 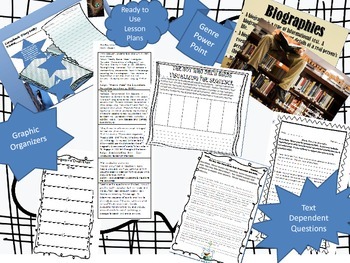 You will be receiving everything you will need in this bundle to teach this unit! First, you will be getting lesson plans that are ready to cut out and glue into your plan book. 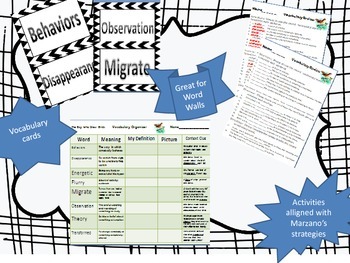 You are also receiving a vocabulary organizer, vocabulary cards, and a vocabulary review. You are receiving a power point on biographies. You are receiving a set of original questions that correlate with WB p. 73-74 and a set of text dependent questions. A spelling activity sheet and an exit ticket have also been included! Finally, you will be receiving a sequencing graphic organizer, a visualizing the sequence activity, and a scrapbook diary entry activity. All of these items have been conveniently placed into one bundle so you will be ready to engage your students! Be on the lookout for other products relating to the McGraw Hill Wonders Series. Thank you for considering my products! Please remember to leave feedback to earn your TPT credits! THANKS!